Citizens' Assembly on Electoral Reform - IMPROVING DEMOCRACY IN B.C. 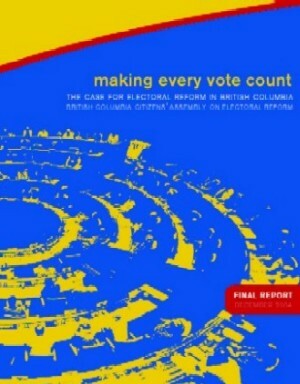 "Election results will be fairer, reflecting a balance between votes and seats, voters will have more choice and candidates will work harder to earn their support," says the final report of the Assembly, Making Every Vote Count: The Case for Electoral Reform in British Columbia. "Political parties will remain at the centre of the electoral process, but they will give up some of the excesses of party discipline and the adversarial style that alienates many voters. The Legislative Assembly will be strengthened in its ability to hold governments accountable." The report was released Friday 10 December 2004. The Assembly also issued on 20 December 2004 a Technical Report, with detailed explanations of the BC-STV system, background documents, and more. This is a 280-page document in PDF format (6MB). It accompanies and expands on the Final Report. It includes a few blank pages so that the index numbering, prepared for the printed version, still applies. In late January, a copy of the Final Report will be distributed to every household in B.C. Copies of the larger Technical Report will be sent in January to libraries, post-secondary schools, MLAs' offices, government agents, and others. After late January, you can get reports from the B.C. Government Distribution Centre in Victoria: 250-952-4460 (toll free 1-800-282-7955). E-mail. The electoral system the Assembly members propose for the province is BC-STV, short for British Columbia Single Transferable Vote. Under the proportional BC-STV system, voters rank candidates by numbers on the ballot paper. BC-STV is designed to make every vote count, and to reflect voters' support for candidates and parties as fairly as possible. It was proposed by the Assembly after almost 10 months of study, research and debate, plus 50 public hearings and 1,603 written submissions from the public. For more information on BC-STV, please explore the links in the box at the top of the right-hand column on this page. Now it's up to the voters of B.C., who will cast ballots on BC-STV in a referendum in the next provincial election, on May 17, 2005. The provincial government says that if voters approve the BC-STV model in May, it will introduce legislation so the new system can go into effect for the 2009 election. The referendum question now reads: "Should British Columbia change to the BC-STV electoral system as recommended by the Citizens' Assembly on Electoral Reform? Yes/No"
Here is information on the referendum and its rules. QUOTE: “. . . The STV system perhaps comes closest to an ideal electoral system. It combines the virtues of proportionality with those of preferential voting. It is a system which politicians, given a choice, would probably least like to see introduced but which voters, given a choice, should choose.” — David Farrell, Comparing Electoral Systems, Herts. : Prentice Hall, 1997 (reprinted by Macmillan 1998, 1999). QUOTE: “The STV electoral system is supported because it is seen as fair since it delivers proportional representation, and because of the power it gives voters to choose their parliamentary representatives by ranking all candidates in order of their choice.” — The international ACE Project (Administration and Cost of Elections). QUOTE: "STV will give voters more real choice but it will also mean minority or coalition rather than majority governments. That's the real choice we face. Ultimately, it's a decision about the kind of government we want, not the mechanism we use to get there." — Craig McInnes, The Vancouver Sun. » WHAT WAS THE CITIZENS' ASSEMBLY? The Citizens' Assembly has proposed a new proportional electoral system for B.C. It's BC-STV, a version of the Single Transferable Vote system that's often called "as easy as 1, 2, 3." The Citizens' Assembly disbanded after issuing its report on 10 December 2004, and its office now is closed. For current contact information, please click on Contact Us at the top of this page. There will be no further updates to this website, now that the Assembly has issued its Final Report and has disbanded. The site, however, will remain online at least through 17 May 2005, the date of the public referendum on the Assembly's proposal. What did the media say about the Assembly and its recommendation? Rafe Mair saying the Assembly was "the best political exercise I've seen." Read it here. And Gordon Gibson telling Vancouver Sun readers why politicians don't like STV. Read it here. This website was launched on 23 November 2003. From then through 20 December 2004, we had a daily average of 317 individual visitors, and they checked out more than 1.6 million pages. The Assembly wound up its fall "Deliberation Phase" on 28 November 2004. That concluded six weekends of deliberation and decision-making. Here are wrap-up pages of documents from the Assembly meetings of September 11-12, September 25-26, October 16-17, October 23-24, November 13-14, and November 27-28. The Assembly received a total of 1,603 written public submissions en route to its recommendation, and you can read them all here. Educators are encouraged to join in the discussion and engage their students in an examination of B.C. 's core democratic values. Use the Assembly's Educational Resources to explore electoral reform in your classroom.